Nearly half of the people of Europe died during the fourteenth century in a great plague. A plague is a widespread illness. The plague paved a path of destruction that played no favorites, killing both the powerful and weak, the young as well as the old. The plague was later called “the Black Death" because of the black spots that formed on the skin of diseased people. The sickness apparently began in Central Asia. In 1347, Italian merchant ships returned from the Black Sea, one of the links along the trade route between Europe and China. The ships were dirty and infested with rats. Fleas living on the blood of infected rats carried the disease and transferred it to the sailors. Many of the sailors were already dying of the plague as the infected ships returned to port, and within days of a disease-ridden ship’s arrival, the sickness spread from the port cities to the surrounding countryside. 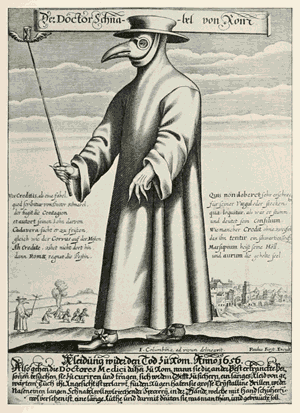 The plague reached Spain, France, England and Russia within three years. Although it is impossible to calculate exactly how many people died from the illness, evidence suggests that it claimed the lives of as many as 25 million people in Europe and Asia. By the time of the plague, many European people were weakened by a slight drop in temperature later called the Little Ice Age. A shorter growing season affected food production, weakening many people in overcrowded cities as a medical disaster loomed. The first sign of the plague was often an ache in the limbs. The lymph nodes would then swell. The lymph nodes are glands found in the neck, armpits, and groin. The swelling continued for three or four days until the lymph nodes burst. The illness is often called Bubonic Plague. Buboes is a Greek word that refers to swollen glands. The swiftness of the disease, the enormous pain, and the grotesque appearance of its victims served to make the plague especially terrifying. Death from the plague was horrible, but swift. The Italian writer Boccaccio said victims often “ate lunch with their friends, and ate dinner with their ancestors in paradise." Europeans were susceptible to disease because many people lived in crowded surroundings in an era when the role of personal hygiene in the spread of disease was not understood. The Europeans often ate stale or diseased meat because mechanical refrigeration had not yet been invented. Fourteenth century medicine in Europe was primitive and unable to remedy an illness that modern technology might have cured. Bad medical advice also advanced the plague. People were advised to not bathe because open skin pores might let in the disease. The devastation of the plague led to advances in medicine. Cities began to build hospitals and enforce standards for sanitation. Some Europeans believed the plague was a sign from God. 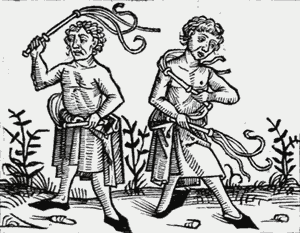 Groups known as flagellants tried to atone for the sins of the world by inflicting punishments upon themselves. The flagellants also had a tendency to persecute Jews and even clergymen who spoke out against them. Eccentric and unusual people were often charged with witchcraft and sorcery. Pope Clement VI condemned the flagellants and the harassment of Jews, but the hysteria continued to reappear in times of plague. The Great Plague transformed European society. Entire villages were sickened, forcing the few remaining survivors to move to cities to find work. Labor shortages caused by the death toll led to increased wages. Feudal lands were often converted to pasture because grazing required less labor than farming. The need for a public response to the health crisis led to a weakening of feudalism and the establishment of modern government in many places. The Great Plague continued to affect cities from time to time for hundreds of years. The plague still exists and is common among rodents. We now have a cure for the disease, but occasionally people in isolated places still die from Bubonic Plague. Mr. Donn has an excellent website that includes a section on the Middle Ages. Doctors who treated the plague wore a beak-like mask filled with perfumed objects. They believed the foul air surrounding a victim carried the disease, so sweet smells would protect them from infection. Groups known as flagellants tried to atone for the sins of the world by inflicting punishments upon themselves. This entry was posted in Middle Ages. Bookmark the permalink.